It was a rocky game for Concordia’s men’s basketball team on Feb. 18. They struggled to contain the McGill Redmen at times, but competed to the final buzzer to clinch first place in the Réseau du sport étudiant du Québec standings. From the opening tipoff both teams came ready to play—the game was a seesaw battle throughout that saw the lead shift 14 times in the final quarter alone. Inattentive third quarter play allowed McGill to go on a run but not before Concordia decided to start rebounding the ball and employing double teams and full court defensive pressure. 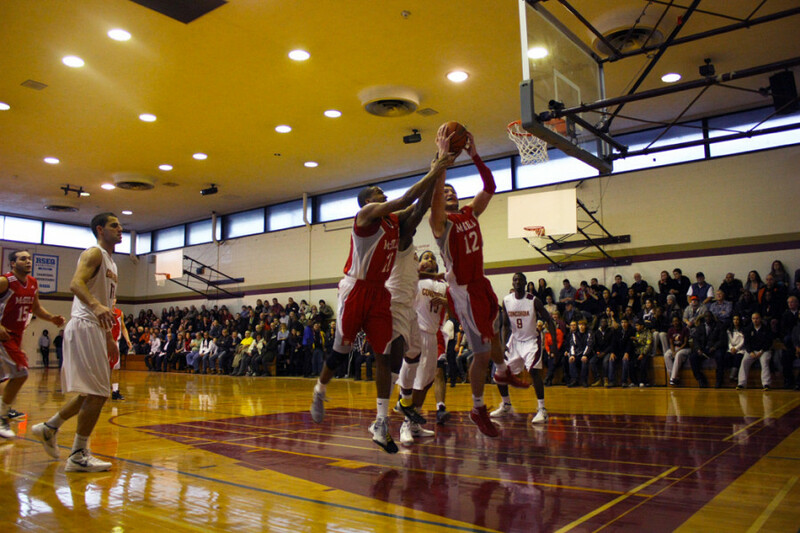 Stingers forward Kafil Eyitayo helped limit McGill’s tendency to pound the glass while helping anchor their defense. The Stingers finally seemed in control when guard Decee Krah managed to break free of the Redmen defense with two minutes remaining in the game and make a three-pointer that extended Concordia’s lead to 60-55. Despite being up by five, turnovers and a pair of missed free throws allowed the Redmen to close the gap. With 10 seconds remaining, the Stingers held a one point lead. “Four seconds is an eternity. They have so many players that can have the experience and can make plays,” said DeAviero. In a game marked by turnovers (Concordia finishing with 21 and Mcgill with 25) Stingers head coach John Dore was happy with the outcome but not with the overall effort. “It was extremely sloppy. They competed hard and slowed us down,” said Dore. Depth is something the Stingers used to their advantage as six players helped out with five points or more on Saturday. This depth will prove essential for them should they reach nationals and stand-out Desmarais thinks depth can only enhance their attack. The Stingers close off their regular season against UQAM on Friday before travelling to Quebec City to take on the Laval Rouge et Or on Saturday. Both games are at 8:00 p.m.